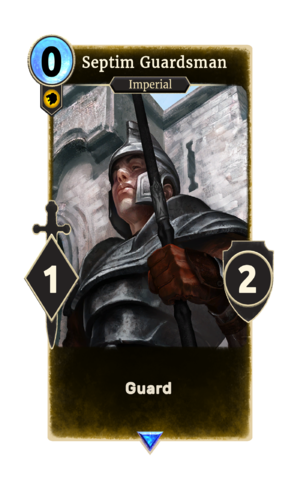 Septim Guardsman is a rare Willpower creature card. It is part of the Core Set. In addition to the card's availability in the Core Set, one copy is included in the Hlaalu Schemes theme deck. The card is named for the Septim Dynasty. The card's attack audio is a reference to the tendency of Daggerfall's guards' tendency to relentlessly yell "HALT!". This page was last modified on 11 March 2019, at 03:50.